Tally was a young Inhuman who had pale skin and long, feather-like red hair. Tally had been desperately in love with one of her fellow Inhumans, but forced into a marriage with another. It was during a time in which the Genetic Council held great sway over the laws and policies of Attilan. Tally was arranged to marry this other Inhuman because they matched well genetically and their union would provide a child for whom Terrigenesis was believed to more likely bring about desirable results. Heartbroken over the matter, Tally committed suicide on the eve of her wedding, throwing herself from a high balcony above the town square. Her tragic death further cemented the growing resentment among the Attilan public over the laws of arranged marriages. The former Queen of Attilan and Black Bolt’s paternal grandmother. Tanith married Symak and together they had two son, Agon and Korath. Agon went on to become the king. Their younger son, Korath declined the position as prince and chose instead to lead the laborers union. Agon married Rynda and had two sons, Black Bolt and Maximus. Korath, meanwhile, married Milena and had one son, Gorgon. Joseph Nobili, the younger son of Gordon ‘Gordo’ Nobili, a smalltime crime boss who went on to become the new Inhuman known as Lineage. Like his father and brother, Joseph possessed latent Inhuman genes and he was transformed following exposure to the Terrigen Cloud. Terrigenesis caused Joseph’s form to change, his frame became elongated and his fingers changed into long, talon-like tendrils. These tendrils glowed with an odd energy that was able to cut and slice through even the hardest of materials. Joseph chose the codename of Tapestry to go along with his new form and superhuman abilities. With their newfound powers, Nobili and his sons sought out their rivals among the Paguros crime family. A massive firefight ensued when the Punisher and The Thunderbolts arrived. Joseph and his brother Carman were both killed in the crossfire. A hulking Inhuman with brown fur and yeti-like features. Targon served as a senior member of the Genetic Council and maintained an isolationist policy, more interested in securing the wellbeing of Attilan rather than establishing diplomatic ties with the human populations of earth. When a phenomena on the blue area of the moon threatened Attilan, Targon sided with Chancellor Arcadius in a craven plot to abandon the people of Attilan, obscene with the Terrigen Crystals, and establish a new Attilan on the recently resurfaced continent of Atlantis. Fortunately, Sue Storm and The Fantastic Four were able to save Attilan. Targon and the rest of the council perished when Atlantis sank back down to the ocean floor. Ian Soo. A latent Inhuman who gained his powers by way of exposure to the Terrigen Cloud. Terrigenesis did not alter Ian’s physical form and endowed him with telekinetic powers, the ability to lift and manipulate objects with the power of his mind. The upper limits of Ian’s telekinetic abilities has yet to be revealed. Ian’s attempt to rob this armored car was foiled by the hero Hellcat (Patsy Walker). Rather than duking it out in typical fashion, Ian and Hellcat ended up bonding on their mutual love of musical theater. Hellcat helped Ian return the stolen money and avoid criminal charges (with the aid of She-Hulk’s legal assistance). Ian and Patsy ended up becoming roommates and he has accompanied Hellcat on a number of her adventures. Although still a bit reluctant to step into the role of a superhero, Ian and often used his powers to assist Hellcat. Created by Kate Leth and Britney Williams, Ian is among the first 616 Inhuman characters to canonically identify as a gay man. Tomoe. A young latent Inhuman who was transformed when the Terrigen Cloud passed over the city of Osaka, Japan. Terrigenesis did not alter Tomoe’s psychical form and bestowed unto her the ability to control machinery with her mind. The full extent of this techno-empathy has yet to be shown, but thus far Tomoe has demonstrated the ability to take control of even the most advanced of mechanical devices (including StarkTech Iron Man battle suits). Tomoe dubbed herself ‘The Techno Goblin’ and used her newfound abilities to consolidate power among the criminal underground of Osaka. She outfitted numerous foot soldiers with advanced weaponry and powers, amassing a veritable army of ‘BioHack Ninja.’ Tomoe’s ninja soldiers crossed paths with Iron Man while on a mission to take out Madam Masque (who was threatening Tomoe’s power grab in Osaka). The ninja tried to kill Iron Man and, though he was able to evade their attack, he was nonetheless impressed with their capabilities and the advanced technology they utilized. Some time later, Stark assigned his colleague, War Machine (James Rhodes), to travel to Japan and investigate these BioHack Ninja. Rhodes was able to track the ninja to Tomoe’s operations in Osaka. When he tried to apprehend her, however, Tomoe used her powers to take over control of the War Machine armor. The armor was stripped off of Rhodes and reformed itself around Tomoe, adding new pieces of tech and machinery to increase the armor suit’s size and powers. Iron Man and The Amazing Spider-Man had also come to Japan to follow up on Rhodes’ investigation. They arrived on the scene before Tomoe could do away with Rhodes. A battle ensued and Tomoe was also able to strip away and absorb Iron Man’s armor. There was a large explosion during the battle in which Tony Stark was apparently killed. Believing Stark dead, Rhodes and Spider-Man were forced to flee. Stark had in fact not died, but he used his apparent demise as part of a ruse to illiterate Tomoe’s operation. He assumed the identity of a mercenary and former Shield agent named Richard Franco. In this guise, Stark gradually worked his way up the ranks of Tomoe’s syndicate. He ultimately gained Tomoe’s trust and she assigned him the task of seeking out and eliminating James Rhodes so to tie up the loose end. Rhode’s meanwhile, had become aware that Stark was not dead and was instead conducting an undercover operation to infiltrate the syndicate. He decided it was too dangerous to allow Stark to go through with it and called in the All New All Different Avengers to extricate Stark and put an end to Tomoe’s operations. Believing that the Avengers had come to Osaka to avenge Stark’s death, Tomoe decided to flee, leaving behind her operation and abandoning her followers and underlings. Although the syndicate was broken up by the Avengers, Tomoe herself was able to escape. Her current whereabout remains unknown. Tauron was an older Inhuman referred to by a citizen presenting his newborn infant to his king, Black Bolt, in the royal court. Taurus was the father of Grimal as well as the cousin to Vel, who had been a close friend to Black Bolt’s father, the former king, Agon. Presenting a newborn’s entire family and genetic lineage was a longterm custom on old Attilan and it seemed clear that Black Bolt found the ordeal to be tiresome and tedious. No other details regarding Tauron were offered, other than he was a carnivore, similar to the male born children of his lineage. A human scientist obsessed with deciphering the mutagenic effects of Terrigenesis so to endow herself with super human powers. Terrigene (whose given name was never revealed) used her family fortune to establish a scientific base in a hidden local somewhere in Tibet. From this base, Terrigen dispatched hired mercenaries to try and abduct any of the Inhumans who had been spotted about the Himalaya Mountain range. ventually, these mercenaries were able to capture the Inhuman known as Sporr, who had left the safe confines of Attilan in search of adventure. Terrigene experimented on Sporr, breaking his genetic code and devised a means to expose herself to the transformative aspects of Terrigenesis. The process did not alter Terrigene’s physical form but gifted her the ability to fly and manifest powerful concussion blasts from her hands. Sporr’s specific abilities enabled him to generate clones of himself. He manages to create such a clone and sent it out in search of a rescuer. This clone eventually found Crystal and led her back to Terrigene’s base. Crystal arrived and a tremendous battle ensued between she and Terrigene. During the chaos, Sporr was able to escape and he created multiple clones to assist Crystal in her fight against Terrigene. Eventually, the evil scientist was defeated and it appeared as though Terrigene’s newfound abilities had burned themselves out, rendering her powerless. Although defeated, Terrigene was able to escape as Crystal tended to Sporr who was mortally wounded in the battle. This was the villain’s sole appearances and her current status and whereabouts remain unknown. Also unrevealed is whether or not her powers returned or is she has been subsequently affected by the Terrigen Cloud. The last son of Thanos the Mad Titan. Some years ago, Thanos had come to earth and had a dalliance with an as-of-yet-unnamed Inhuman woman. The affair had left this woman pregnant, but she hid the identity of the father. Once the child was born, she named him ‘Thane’ and left him among the peoples of the remote Inhuman settlement known as Orolan. Thane grew up in this settlement and learned the healing arts, ultimately matriculating to become the official healer of Orolan. Years went by and somehow Thanos came to learn that he had a son living among The Inhumans of Earth. A prophecy had stated that only the child of Thanos could stop his evil plans and this led Thanos to scour the galaxy and kill any child he had sired over the years. 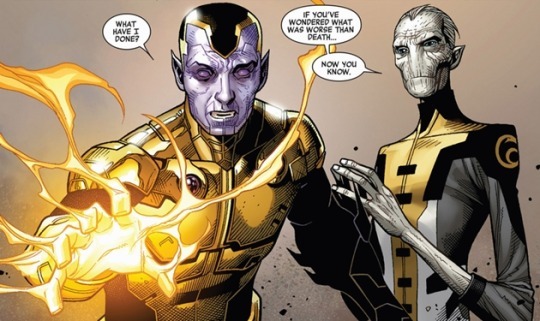 The last remaining such child was on Earth and Thanos sent his emissary to Attilan to demand the execution of all Inhuman children within the age-range of Thanos’ progeny. Of course King Black Bolt denied this horrific demand and war between Thanos’ forces and The Inhumans became an inevitability. Back Bolt was well aware that the Inhumans of old Attilan stood no chance against Thanos and his army. He was additionally aware of the cascading incursions by entropic alternate realities, the Makers, and all of the other meshugas entailed in the Infinity Event. The dire circumstance led Black Bolt to take drastic action. Assisted by his brother, Maximus, Black Bolt detonated the Terrigen Bomb. This bomb resulted in a massive cloud of Terrigen Mist that triggered Terrigenesis in any and all latent Inhumans that it came into contact with. The cloud eventually made its way to the remote location in Greenland where Orolan was located. Exposure to the mists unlocked incredible powers in Thane and his mere terigenic transformation created a massive explosion that killed all of the other Inhuman who had been living in Ortolan (Lash and Reader remain the only other denizens of Orolan to survive). Arising from the crater of this explosion, Thane had been transformed into a tall, muscular being with purple skin, pointed ears, and glowing eyes. The incredible powers bestowed unto him allowed him a degree of control over the very essence of time and space. From his right hand he can project an amber-like field that freezes time and space in complete containment. From his left hand he could exude a black substance that triggered instant entropy, corroding any substance it came into contact with. These powers were extremely difficult to control and wielding them improperly resulted in devastating explosions. Following The Infinity Event, Thane and The Ebony Maw left erth to continue his training. Thane eventually relocated to the alien world of Brennan 7, a desolate world that had become a gathering place for many alien refugees and outcasts from throughout the war-torn galaxy. Thane became something of a holy man, offering protection and spiritual salvation to the various refugees who had relocated to Brennan 7. Some time later, Thane entered into a pact with Mister Knife in an effort to obtain the mystical object known as The Black Vortex. Departing Brennan 7 to search out this Vortex, Thane’s flock was left unprotected and they were all murdered by a group of killers known as the Slaughter Squad. Thane ultimately found the Vortex and used it to greatly amplify his powers. He returned to Brennan 7 to find his people killed. Mr. Knife convinced Thane that the Guardians of The Galaxy were responsible for the death of his flock and, in retribution, Thane encased the entirety of the planet of Spatex in an amber stasis filed, trapping The Guardians along with The X-Men. All of this turned out to be a part of an intricate scheme hatched by J’son of Spartex. Posing as Mr. Knife, J’son tricked Thane into encasing Spatex in Amber. The Guardians and X-Men were eventually able to escape and Thane was made aware of how he had been duped. It was actually J’son who had ordered the killing of Thane’s flock on Brennan 7. Thane released the world of Spartan and then trapped J’son in an amber field, casting the encasement into space to wander off for eternity. Thane’s his current status and whereabouts remain unknown. A former dignitary of Old Attilan. Thraxton had acted as the leader of the Labor Union after its former leader, Korath, was killed during one of Maximus’ attempts at a coup. Thraxton assumed control of the rebuilding of a large section of Attilan after it was destroyed by Black Bolt. Black Bolt was under the mental influence of his brother, Maximus, who was in league with agents of The Kree. Once Black Bolt was able to break free of this influence he determined that the Royal Family would go off in search of the Kree villains who still threatened the Inhuman peoples while the city was being rebuilt. Crystal and her husband, Quicksilver, remained behind with Lockjaw to oversee the rebuilding of Attilan; whereas Thraxton was charged with managing the construction. Thraxton was a very ambitious individual and he utilized this assignment to enact a plot to ultimately overthrow Black Bolt and become the supreme monarch of The Inhumans. Secretly, Thraxton had entered into a pact with the celestial being known as The Sphinx. The Sphinx endowed Thraxton with immense powers, powers he later used against Black Bolt and The Royal Family. With the assistance of the Fantastic Four, the Royal Family were eventually able to defeat both Thraxton as well as the Sphinx. Ultimately, The Sphinx took from Thraxton the awesome powers he had bestowed him, leaving him weakened and powerless. It’s assumed that the would-be despot was imprisoned on Attilan, but his fate, current status and whereabouts remain unknown. A Dire Wraith and member of the Universal Inhumans, The Universal Inhumans were a conglomerate of beings from disparate worlds all of whom had been subjected to the same Kree genetic manipulation that had created the Inhumans of Earth. Thunn was the primary advisor to Queen Avoe, the leader of the Inhumans of Wraithworld in the Dark Nebula. Whatever special inhuman powers Thunn may possess were left unrevealed. Thunn returned with his queen to their home world once The Kree had been defeated and Black Bolt formally dissolved the Court of The Universal Inhumans. An Inhuman with calcified skin that resembled tree-bark. He possesses increased strength as well as the ability to regrow limbs and aspects of his bulk that might be lost or damaged in battle. On one occasion, Timerius demonstrated the capacity control plants and other types of natural flora. An ally of Maximus in one of his many bids to usurp his brother’s throne. Timberius was briefly banished from Attilan once Maximus’ coup failed. It was later determined that many of Maximus’ minions were likely under the thrall of the mad prince’s mental control; and Timberius was ultimately exonerated and allowed to return to Attilan. Some time thereafter, Timberius was recruited into General Ator’s specialized military unit, The Crimson Cadre. Timberius had a twin brother named Naanis who had perished in a skirmish with human forces prior to Attilan’s relocation from Iceland to the remote mountain top in The Himalayas. Timberius had spoke before the Royal Court and Genetic Council advocating for a counterstrike against the humans so to extract vengeance over Naanis’ death as well as the other Inhumans who had been killed. The Royal Court ultimately ruled that Attilan continue to seek a resolution through diplomacy, much to Timberius’ consternation. Later, Timberius snuck out on his own and located the human military officer who had been responsible for Naanis’ death, slaughtering the soldier and honoring his brother’s death through bloody revenge. On multiple occasions, Timberius has again sided with Maximus in the prince’s many attempts to wrestle leadership over the Inhumans from his brother, Black Bolt. It has yet to be made clear whether or not Timberius aided Maximus of his own volition, or if he was again manipulated via Maximus’s significant psychic powers of persuasion. Timberius’ current status and whereabouts remain unknown. Timberius first appeared in Incredible Hulk Special #1. An Inhuman with bear-like anthropomorphic physique. Tolos was a member of the Royal Guard and patrolled the grounds of Attilan during the nightshift with his partner Kiren. A bit of a gossip, Tolos seemed to enjoy discussing the rumors regarding the disquiet in King Black Bolt and Queen Medusa’s relationship. Unfortunately, talking about such rumors proved a distraction and Tolos and his partner did not see the attack Outrider until it was too late. The two were killed by the marauding Outriders, who had come to infiltrate Attilan in order to glean secret strategical information from Black Bolt. Tolos and Kiren were ultimately avenged when Black Bolt destroyed the Outrider whom had taken their lives. A member of the younger generation of the Inhumans of Old Attilan. During her preadolescence, Tonaja had been a happy and well-liked youngster; a natural leader among her peers and best friends with a girl named Kalikya. Tonaja was very apprehensive toward the prospect of Terrigenesis. She did not want her life to change and was anxious about how the Terrigen Mists might transform her. Tonaja’s fears were eased by her grandmother who comforted her on the eve before the ceremony in which she would enter into the chamber of Terrigenesis. Expose to the mists bestowed Tonaja highly fortunate powers. She was changed into a beautiful woman with green skin, long tendril like hair and a pair of bat-like wings enabling her extended flight. Being a ‘flyer’ was viewed as a great blessing in the cultural traditions of old Attilan and Tonaja was hugely proud of her gifts as well as the fact that, as a flyer, she would most likely be tracked into the prestigious role of Royal Guardsman. Tonaja’s friend, Kalikya, was apparently not so fortunate and it seemed as though Terrigenesis had not bestowed her with especially useful gifts. Tonaja was too eager to start her new life and she coldly snubbed Kalikya, essentially telling her that their friendship was over and that she no longer had time to fraternize with ‘lessor’ Inhumans. Tonaja trained with Gorgon and a number of the other more powerfully enhanced Inhuman youths in order to eventually join the Royal Guard. Some time later, during the siege of Attilan by a human military force, many Inhumans lost their lives and Tonaja and the younger members of the guard were caught ill prepared. During this battle, Tonaja’s former friend, Kalikya, acted with great valor, rescuing a number of injured Inhumans. Although Kaliya’s special powers were not initially evident, it turned out that she possesses the ability to heal severe wounds by merely placing her hands on a patient. Being a healer was viewed as even more prestigious than being a flyer on old Attilan and Kalikya was greatly lauded for her actions during the siege. Afterward, Tonaja approached Kalikya, asking if the two might rekindle their former friendship. Still hurt by the way in which Tonaja had previously turned her back on her, Kalikya declined, effectively stating that it would be best if the two remained colleagues but never again good friends. Sometime thereafter, Tonaja entered into a romantic relationship with her fellow Inhuman, Dewoz. The two had been friends when they were younger and Tonaja was aghast when it appeared as though Terrigenesis had transformed Dewoz into the form of an Alpha Primitive. All of this was actually an elaborate ruse orchestrated by Maximus and Dewoz was ultimately able to reclaim his true Inhuman form, that of a tall, purple-skinned being who can teleport through reflective surfaces. Maximus’ tinkering notwithstanding, Dewoz still felt a great deal of alienation from his peers due to his possessing features and mannerisms similar to that of The Alpha Primitives. Tonanja worked through her own prejudices in coming to terms with her love for Dewoz and his love for her. Following her training with the Royal Guard, Tonaja was selected to take part in an emissary/student-exchange program meant to augment relations between Attilan and the United States. Tonaja assumed a leadership role within the group of emissaries and she appeared to enjoy her time on earth. The emissaries were eventually recalled back to Attilan and the program itself was deemed something of a failure. Tonaja went on to serve in Royal Security Force. Following the taking of Attilan by Ronan The Accuser and his Kree Army, Tonaja stood with a group of Inhumans who stated that they had lost faith in King Black Bolt and his Royal Family. The Royal Family was temporarily banished from Old Attilan while the rest of the Inhumans went in search of their own destiny among the stars. This turn of events did not last long and soon The Royal Family once again earned rulership over Attilan. This was the most recent that we have seen of Tonaja and her current status and whereabout remain unknown. 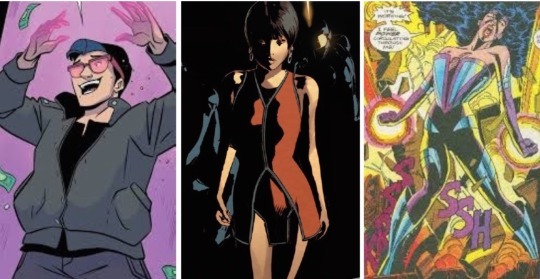 Tonaja first appeared in Marvel Knights: Inhumans #1; her further adventures took place in Young Inhumans #’s 1-12. A hulking Inhuman with bronzed skin and dark hair that seemed to naturally form into a spiky formation. The exact nature of Tonee’s Inhuman powers has yet to be revealed, although the fact that his nickname is ‘Big Tonee’ suggests that he either possesses enhanced strength or possibly the power to increase his height and mass. Tonee was a patron of Rexel Toiven’s tattoo parlor and together they often talked about the mounting tension between the Inhumans of Attilan and the humans of the outside world. Tone maintained a hawkish view on the subject and argued that the Inhumans should go out and exert their dominance over the humans, make the humans suffer so they might think twice about bothering the denizen of Attilan and leave the Inhuman in peace. Tonee’s current status and whereabouts remain unknown. He first appeared in Marvel Knights: Inhumans #4. An Inhuman of Old Attilan. Terrigenesis transformed her in a significant fashion, taking her eyes, ears, nose, all of her senses save for the sense of taste. This sense of taste is so extreme and elaborate that it compensates for all the other senses. She can taste the air and know where objects exist in space; can taste words spoken and hence communicate with other; and can even taste abstract concepts such as contempt and irony. Tongue used her augmented sense of taste to become a master of the culinary arts, preparing meals and dishes so delicious that it made her a celebrated chef on Old Attilan. The approbation earned by her culinary skills notwithstanding, Tongue could ‘taste’ that others were repulsed by her grotesque appearance and it left her feeling alienated and sullen. Following the Infinity event and the establishment of New Attilan, Tongue left the Inhuman society to live among the acolytes of Karnak’s new Tower of Wisdom. There she cooked meals for the other believers and gleaned the sense of belonging and acceptance that had previously eluded her. Thomas Raymond is the son of Fred Raymond, a physicist who had been the assistant to scientist, Professor T. Horton (the man who created the original Human Torch). The various chemicals and substances that Fred was exposed to during construction of The Human Torch left him seriously ill. After leaving Horton’s employ, Fred met another scientist named Nora who herself was ill due to radium exposure. The two fell in love and married, not expecting to live very long. Un-expectantly, Nora became pregnant and they had a son they named Thomas (they nicknamed him ‘Toro’ in that he was conceived after the couple had gone to see a bullfighting match). During Thomas’ early childhood, his parents realized that he had an immunity of fire and Nora theorized that he must be a Mutant. Thomas’ parents died during his early adolescence and, through a series of events, he came under the care of Jim Hammond, the Original Human Torch. Furthermore, Thomas’ powers expanded and it turned out that he possesses the same capacity for flight and fire manipulation as The Torch himself. Soon thereafter, the Second World War erupted in Europe and Thomas accompanied The Human Torch to fight the Axis powers as a member of The invaders. He chose the codename ‘Toro’ in honor of his parents. Toro served with the Invaders throughout the war, along with short tenures with he younger super teams, The Kid Commandos and The All Winners Squad. He developed a close friendship with his fellow teenage colleague, Bucky Barnes. Following the war, Toro continued to work alongside The Human Torch as a costumed hero. The Torch apparently died in the process of foiling a Soviet plot to detonate a specialized bomb. Shortly thereafter Toro decided to retire from super heroics. He met a young woman, got married and went on to live a relatively normal life. Sometime later, Toro was abducted by the evil scientist known as The Mad Thinker. Using his sinister devices, The Thinker managed to convince Toro that he was actually The Human Torch and set him off on a bent scheme that put Toro into conflict with Prince Namor The Sub Mariner. This scheme was ultimately foiled, but Toro apparently perished in the process. Toro was eventually resurrected via the power of the cosmic cube. Revived to his younger self, Toro returns to his life as a crime fighter, which once again brought him into conflict with The Mad Thinker. It was also revealed that The Original Human Torch had not died as was initially suspected and the two were reunited as a crime fighting duo. Later, during the Infinity Event and the detonation of The Terrigen Bomb, Toro was subjected to The Terrigen Cloud. This caused him to go through Terrigenesis, yet the experiences apparently left him unchanged; and it was ultimately revealed that Toro had been an Inhuman all along. His mother’s postulation that Toro had been a Mutant was only partially correct. He is actually an Inhuman and his parents’ exposures to mutagenic substances prior to his birth caused him to develop his Inhuman abilities without the process of Terrigenesis. Toro then went on to join the new version of The Invaders, fighting alongside his former allies, The Torch, Captain America, Bucky and Sub-Mariner, along with his fellow Inhuman, Iron Cross. More recently, Toro has turned up in the pages of the current Squadron Supreme series. Here it has been revealed that Toro has acted as an agent of Black Bolt investigating an undersea laboratory where a group of alien scientists were dissecting and studying Inhumans and Mutants. With the aid of Black Bolt and Doctor Spectrum, Toro destroyed this undersea laboratory. Toro’s current status and whereabouts remain unrevealed. Tral was an Inhuman telepath with purple skin and a grossly enlarged cranium. Tral’s psychic powers enabled him the capacity for mind control. A villainous sort, Tral fled from the confines of Old Attilan to rule Tibet where he used his mental powers to enslave a small village. This village was happened upon by the Adventures known as ClanDestine. Tral attempted to use his powers on Albert Destine. Albert’s own telepathic powers proved too much for Tral and, though it wasn’t intention, the feedback was so severe that it caused a cerebral aneurysm, killing Tral instantly. Another version of Tral existed in the alternate Earth-80522 universe. In this universe, Tral was able to increase his powers exponentially. He took control of Attilan via a puppet leader in the form of Maximus The Mad. Under Tral’s control, Attilan waged a war on the human world and eventually conquered all of Earth. Trap enslaved humanity, forcing many of the human to entertain him in the form of gladiatorial games. The Earth-80522 universe was visited by members of the ClanDestine along with the super team known as Excalibur. The two teams were able to defeat Tral’s minions and exposed him as the true power behind King Maximus. The Inhumans revolted and Tral perished. Afterward, the remaining Inhumans pledged to repair the damage Tral had done to their world. A Universal Inhuman among the Badoon race. The Universal Inhumans were a conglomerate of beings from disparate worlds all of whom had been subjected to the same Kree genetic manipulation that had created the Inhumans of Earth. Trav possesses specialized vision enabling him to see on multiple spectrums of light at the same time. He acted as the primary bodyguard to his Queen, Aladi Ko Eke, during her time as a member of the Court of The Universal Inhumans. Once The Kree threat had been defeated, Black Bolt formally dissolved the Court of The Universal Inhumans and Trav Lo Naa and his queen returned to their home of Lotlara. Treste is one of the twin daughters of Auran, the former chief of internal security of New Attilan. The identity of Treste and her sister’s father has yet to be revealed. The twins were orphaned when Auran sacrificed her life to protect her partner, Frank McGee, from an attack orchestrated by Maximus the Mad. Following Auran’s death, McGee assumed guardianship over Treste and her sister. Although Frank has proven a good and loving parental figure, the twins havee been unable to truly accept the death of their mother. Somewhere down the line Treste and Irelli came to learn of the powers possessed by The Inhuman known as Reader. Reader is a reality manipulator who is able to manifest into reality anything that he reads. Having discovered this, Treste and Irelli set off on an intricate plot to utilize Reader’s abilities to resurrect their mother. The twins began gathering as much information on their mother as they could, transcribing it all into a book. They wrote down their own memories of their mother and then interviewed everyone who knew her, diligently researching every aspect of her life and adding it to the book. Meanwhile, Treste set about trying to recruit Reader to their cause. Although she is only 16-years-old, Treste appears much more mature for her age and, with make-up and a fancy outfit, she was able to gain access to the secret nightclub known as The Quiet Room. Having made her way into the club, Treste introduced herself to Reader and flirted with him. This was all broken up when Frank arrived and chastised Treste for sneaking off to a bar in the middle of the night (Reader, whose blind, was quite mortified that he had been inadvertently flirting with a minor). That same evening a secret formula was stolen from The Enilux Corporation who were holding a summit at the Quiet Room’s banquet hall. The theft threatened to undermine the peace treaty between Ennilux and New Attilan and McGee was assigned to investigate the matter and return the formula. Treste was allowed to join the team McGee put together for the mission. It turned out the formula had been stolen by an agent of The Capo, who had been the former leader of Enilux. McGee and the others were able to defeat The Capo and retrieve the formula, yet the Capo escape by transporting his consciousness into Reader’s dog and companion, Foray. Later that night, Treste sought out Reader and offered to assist him in tracking Foray down and rescue him from The Capo’s possession. Reader reluctantly agreed. Treste was actually killed in the ensuing conflict, but Reader was able to use his powers to rewrite the events of it all so that Treste survived. Following the Civil War II event, Treste and her sister completed the book about their mother. They printed the whole thing out in brail and presented it to Reader, ultimately coaxing him into reading it and thus bringing Auran back. Reader warned the twins that the version of Auran who could be brought back may not be the same as she once was, but Treste and Irelll refused to be dissuaded. Ultimately, Reader gave in and read the book. Meanwhile, Frank was able to discover what the girls were up to. he rushed to the Quiet Room to try to stop them but arrived too late. Quran was resurrected by way of Reader’s powers. Whether or not this will be the ‘true’ Auran that he daughter’s remember has yet to be revealed. Treste first appeared in Uncanny Inhumans #5. The Trikon was a disembodied psychic force created by Maximus, made up of the minds and sentiences of three Alpha Primitives. Maximus had imprisoned these Alphas and subjected them to a bizarre scientific process that dissolved their bodies and unified their consciousness into a floating gas collected around three glowing orbs. The entity possessed incredible powers ranging from telekinesis to energy projection. Maximus maintained mental control over this new entity and he was able to use it’s awesome powers to trigger a revolt among the Alpha Primitives… all in yet another attempt to subjugate Attilan and dethrone his brother so to take the crown for himself. During the ensuing melee, The Trikon struck Medusa, knocking her off her sky sled. The mental blast from the Tikon had left Medusa with severe amnesia and ultimately led her to wander off aimlessly through central Europe until she fell into the clutches of the villain known as The Wizard (eventually leading to her short tenure as part of the Frightful Four). As the Trikon’s powers grew in power it became more and more difficult for Maximus to control. Eventually the entity left Attilan to search the universe and there it was captured by the celestial being known as The Stranger. The Stranger captured The Trikon and kept it prisoner in his labworld base of operations. There it remained until it was ultimately freed by a being known as the Overmind. Its current status and whereabout remain unknown. An amphibian Inhuman with green, scaled skin, pointed ears and fish-like facial features. Triton is the elder brother of Karnak, the son of Mander and Azur, and cousin to King Black Bolt. As a result of the effects rendered upon him by Terrigenesis, Triton has remained by far the most alienated and isolated member of the Inhuman Royal Family. Triton was exposed to the mists during early adolescence. It mutated him into an anthropomorphic, fish-like being with the ability to breath underwater and survive in inhospitable, zero-oxygen environments. Unfortunately, it also left him unable to breath regular air and he had to be sequestered to a specialized aquatic tank so to keep him alive. Triton’s new physical form and abilities were deemed as highly unattractive and unfortunate by the standards of old Attilan; the compensatory actions needed to keep him alive were a source of great embarrassment and consternation to his aristocratic parents. So great was their disappointment over what had happened to Triton that they chose not to have their younger son, Karnak, go through the process of Terrigenesis. Triton had a very solitary childhood and young adulthood, largely spent stuck in his life-sustaining aqua-tank. He was eventually outfitted with an aqua-suit that enabled him to move about freely throughout Attilan – although this did little to abate his loneliness. 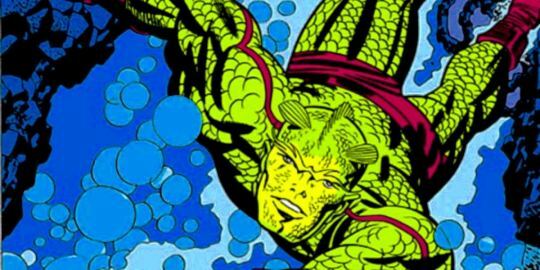 Triton’s brother, Karnak, was often merciless in his teasing, referring to Triton’s freakish appearance as a warning of the haphazard nature of Terrigenesis. Karnak seemed to be honorable and thoughtful in all other areas of his life, yet when it came to his brother, he often devolved into a cruel adolescent. Despite the isolation that he had endured, Triton grew into a highly compassionate, noble, and empathetic individual. Stoic and laconic, Triton gradually earned the respect and admiration of his fellow Inhumans and became a valued member of Black Bolt’s royal entourage. Triton remained loyal to Black Bolt during Maximus’ coup and temporary ascension to the throne. He traveled with the others to the humann world in search of Medusa who had fallen prey to the manipulation of the villain known as The Wizard. Although it was a perilous adventure, Triton seemed to greatly enjoy his time outside of Attilan. He reveled in the freedom afforded to him swimming about the Earth’s oceans. Like his cousin, Crystal, Triton was quite fond of the human adventurers, The Fantastic Four, and even joined them for a short time as an auxiliary member of their team. At one point, Triton was instrumental in rescuing Reed Richards after he had become lost in Negative Zone. Maximus ultimately developed a more streamlined protective device for Triton that enabled him to survive out of the water in an unencumbered fashion. Though he was now free to roam Attilan on his own, his isolated feelings of not quite fitting in persisted. At one point Triton met Prince Namor The Sub-Mariner and toured the underwater kingdom of Atlantis. Atlantis felt more like a home to Triton than Attilan ever had and he was tempted to remain there, turning his back on his home and race of origin. Triton ultimately opted to return to Attilan, although he remained a close friend and ally to Namor and the people pf Atlantis. Triton and Namor had many adventures together and their friendship cemented an important diplomatic tether between Attilan and Atlantis. At one point, Triton joined a group of sea-faring heroes formed and led by Namor called The Deep Six. Triton has proven his metal as a skilled combatant on numerous occasions, serving with distinction during The Kree-Skull War, as well as during skirmishes with formidable foes, including The Hulk, Attuma, Plantman, The Pursuer, and The Mandarin. There was one adventure where Triton saved all of Attilan (as well as the members of the Fantastic Four) by searching out and destroying a bizarre lunar crystal that was emitting a powerful hallucinatory influence. This valiant act was done on his own with much of Attilan unaware that it was Triton who had saved them. Being a quiet and modest sort, Triton chose not to divulge this act of heroism. Some time later, Triton’s physical form began to further mutate. His dorsal fin became more pronounced and his face and body took on a more serpentine look. For reasons yet to be told Triton has since reverted to his more original form; and then mutated back to the serpentine form once again (no explanation has been offered and it’s likely just a matter of different artists preferring to illustrate Triton in different fashions). During the Secret Invasion event, Triton traveled to the planet Pelagia. There he encountered a race of beings whose physical form and abilities very much resembled his own. Although he was foreign to this world, Triton felt a sense of belonging there that he had never before encountered. A part of him wished to stay among these people, yet he was on a mission for his queen and his duty and loyalty to The Inhumans overruled his own needs and hence he returned to the others in time for their decisive strike against the Skrulls. Following the defeat of the Skrull forces, The Inhumans found themselves embroiled in an interstellar conflict between the Kree and Shi’Ar Empires. During this War of Kings event, Triton led a specialized branch of the Royal Guard largely made up of aquatic-type Inhumans. The various aquatic skills these Inhumans possessed loaned themselves very well to the zero gravity combat situations crucial to this war. Triton served with great valor and his heroism was highly lauded by the many Kree soldiers he served alongside. Once The Shi-Ar despot, Vulcan was killed and his empire shattered, The Inhumans found themselves in the position of acting as the de facto rulers of the decimated Kree Empire. Medusa ruled over the Kree from the empire’s new home world of Kon-Tar while Triton was tasked with leading a scientific survey of a nearby astro-phenomena known as ‘The Fault.’ Triton was assisted in this survey by the Kree scientist named Ra-Venn. Although Triton had not yet before showed romantic interests in others, there seemed to be something of an amorous mention between the two. Sadly, Ra-Venn perished when their vessel was invaded by mutagenic spore originating from within The Fault. The Inhumans eventually returned to Earth and Triton and the others enjoyed a short respite, a peace that was ultimately shattered by the coming of Thanos and the subsequent Infinity Event. During this event, Triton helped in the evacuation of Attilan prior to Black Bolt’s detonation of The Terrigen Bomb. Following the fall of old Attilan and the apparent demise of King Black Bolt, Triton has remained by Medusa’s side. His former aqua-suit had been damaged and he has had to return to utilizing a more cumbersome device that includes a mouth-cover and tubes that connect to an aqua-tank fastened into a backpack. Stoic as always, Triton has yet to complain about the matter. Following the Secret Wars event, Triton accompanied Black Bolt and Reader in a mission to save Black Bolt and Medusa’s son, Ahura from the grasp of Kang The Conquerer. This initial effort to rescue Ahura was ineffective, leading a second attempt alongside Medusa and her Uncanny Inhumans squad; they were ultimately successful and Ahura was reunited with his parents. More recently, Triton has broken rank with his queen, Medusa. He did not feel that Medusa’s acts to take revenge on Tony Stark for his incursion onto the sovereignty of New Attilan was drastic enough. Triton believed that more severe action needed to be taken so to deter other would-be invaders. This led Triton to elicit the aid of his cousin, Maximus. This proved to be folly in that Maximus took things way too far, resulting in numerous deaths. Triton ultimately confessed to his part in Maximus’ bent schemes in order to end a violent conflict between Iron Man and The Inhumans of New Attilan. Triton agreed to surrender himself to the authorities. Triton was last seen being taken into police custody on unspecified charges and what will eventually come of this has yet be revealed. An Inhuman who has thus far only appeared in the Ultimate Marvel Universe. She was a young woman formerly known as Sapphire prior to her transformation. After bathing in the Terrigen Mists, she arose a new being with dark purple skin and an all-seeing third eye in the middle of her forehead. She was renamed ‘Tri-clops’ and her third eye was able to see in the dark, decipher secrets, and detect objects normally invisible to the naked eye. Her preternatural vision was even able to penetrate Sue Storm’s invisible powers and alerted the others that The Ultimate Fantastic Four had infiltrated Attilan. It is unknown if a version of Tri-clops exists in the 616 Marvel Universe. Tuk The Cave Boy. An Inhuman who lived many centuries ago. Tuk’s parents were among the first citizens of the isle of Attilan. Tuk’s father, Phadion, did not agree with the King Myron’s decision that the Inhumans live in complete isolation form the outside world. Phadion challenged Myron for rulership over Attilan. He failed in this bid and was subsequently banished from the isle. Phadion’s wife, Rhaya, chose to accompany her husband in exile along with their infant son, Tuk. The two were ill prepared for the savage, uncivilized environment outside of the confines of Attilan. Both perished, but their child was saved by a kindly ape-man named Ak. Ak brought young Tuk to his own tribe and raised him as one of their own. Ultimately Ak informed Tuk of his true origins, urging the lad to venture out in search of his rightful place among the citizens of Attilan. Tuk had many adventures in his efforts to locate Attilan. He gained a trusted ally in a Cromagnon Man named Tanir; he battled the savage Hairy Ones, visited Atlantis and saved Princess Eve from the clutches of the evil Witches of Endor. Tuk’s various exploits were told in a series of backstory tales published in the original 1941 run of Captain America Comics. Whether or not Tuk was ultimately able to return to Attilan remains unrevealed. An Inhuman with two large tusks that protrude out of his shoulders. He possesses superhuman strength as well as the ability to manifest smaller duplicates of himself that do his bidding. His early life remains unknown, but at some point he left Attilan and was recruited by Apocalypse to be a member of his Dark Riders. These Dark Riders were a group of vicious killers who targeted mutants, Inhumans, and humans alike all as part of a survival of the fittest agenda. To this end, Tusk and his comrades had multiple run-ins with The X-Men. Apocalypse was ultimately defeated, but many of the Dark Riders managed to escape. Years later, Tusk and The Dark Riders resurfaced after it was revealed that the Terrigen Cloud was deadly to Mutants. Once again endeavoring on a twisted crusade of survival of the fittest, The Dark Riders hated down any and all Mutants who possessed healing powers. This brought the Riders into conflict with the latest iteration of the Uncanny X-Men. Tusk was seemingly killed when Magneto ensnared the Riders in a series of explosions that blew up the remains of Geonosha. Although this may not be the last we see of Tusk and his fellow Dark Riders. Lord M’Dom Typ was the leader of the warrior bird people of Aerie Shalan, an outpost of the floating city of Aerie founded many years ago. Type assisted Sahnna the She-Devil and helped her in rescuing her partner, Ka-Zar the Savage. Some time later, all of The Savage Land was destroyed by the terrible villain, Terminus. It is unknown whether M’Dom Typ and his people were able to escape this destruction and their current collective fates remain unknown.